Sudden jerk during sleep is known as hypnic jerks. This is associated with a loud banging, flashed of light or noise. One might experience the sensation of falling or tripping. Often we find ourselves waking up from sleep with a sudden jerk, and this is what is known as hypnic jerks. The sudden jerk could be of the arms, legs, or even the entire body, and is found to be repetitive in children. They however are not the same as nocturnal seizures, so you should not confuse yourself. This hypnic jerk is often closely linked to flashes of light, loud banging, noises, and as well as sensations such as falling, tingling or even floating. But then again, we should mention that it is a natural part of the sleep process, and some experts even believe that it is simply the body’s way of twitching and shutting itself down for rest. Let us understand this in full detail. 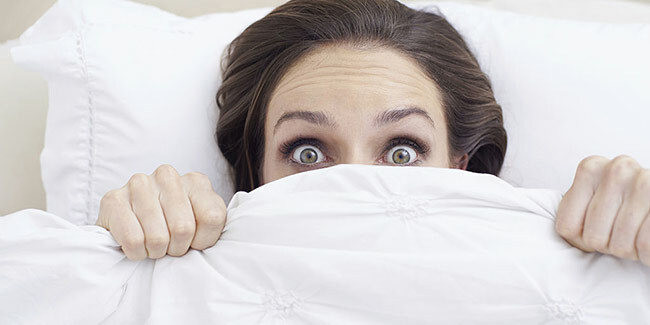 Of course as many of us must have thought, “what is the cause for this hypnic jerk?” One of the leading theories says that this usually happens when the body is going through a very quick first stage of sleep. This means that the body is so exhausted that it is going to sleep at a fast rate. The first stage of sleep lasts for a few minutes, and during this process, your breathing and heart rate slows down, and your sleep happens to be light. So, during this process when the body is speeding to rest and it shuts down too fast. This in turn tells your brain that your vitals are shutting down, and the jerk happens in response to this to wake your body up. For all you know, this response could be a way to help your body and protect it. The jerking effect that causes you to wake up could be accompanied by dreams of falling usually, or even leaning too far back on a chair and tripping. It is a rather scary feeling of losing balance and waking up in a jerk. It is also believed that these hypnic jerks happen when someone is depriving himself or herself of the quantity and quality of sleep. This means that it is recommended that you allow yourself a good 7 to 9 hours of sleep each night. Another reason for this also could be that you are affecting the quality of your sleep by stress, caffeine, or you have sleep disorders such as insomnia. Also, alcohol could be another factor due to which people get hypnic jerks. Alcohol does not allow you to get a full sleep, and therefore you might have disturbed sleep causing hypnic jerks. One way to prevent hypnic jerks is by allowing yourself sleep hygiene, which you need to follow every night routinely. Also, you should watch what you eat, as an improved diet helps. If you do too much of heavy exercises too close to bedtime, then you are running the risk of a hypnic jerk. Drinking too much before sleep could also be another reason. Also, smoking needs to be curbed. Listen to some relaxing music as it really helps your mind and puts you to sleep. You should also practice meditation, as this is a good way to keep your focus on the positive side. If your hypnic jerk is too regular then you must make sure to visit a doctor for help.